Hurra.com helped bonprix, a leading fashion retailer, complement standard text ads with Product Listing Ads, achieving a 50% higher click-through rate and 30% higher conversion rate at the same cost-per-click. enables merchants to offer a fast buying experience to Google Wallet shoppers buying physical goods and services on their Android apps and websites, while processing their own payments. In addition, the new Wallet Objects API enables merchants to engage their customers with loyalty, offers, and more. All Google Play developers will continue to be supported. Also, shoppers can continue to use Google Wallet to make safer and more secure payments anywhere they see the Google Wallet button. Merchants can continue to accept payments using Google Checkout until November 20, 2013. If you don't have your own payment processing, you will need to transition to a different solution within six months. To make things easier, we've partnered with Braintree, Shopify and Freshbooks to offer you discounted migration options. If you are a U.S. merchant that does have payment processing, you can apply for Google Wallet Instant Buy, which offers a fast buying experience to Google Wallet shoppers. We invite merchants to join us for a live webinar on May 23, 2013 at 10AM PST to learn more. Or, you can visit the Help Center for more details. Developers selling through other Google properties (such as Google Play, Chrome Web Store and Offers Marketplace) will continue to be supported and will automatically transition to the Google Wallet Merchant Center in the next few weeks. Shoppers can continue to use Google Wallet to make purchases on merchant apps and sites (such as Priceline, Uber, and Rue La La), as well as on Google properties, such as Google Play and Chrome Web Store. 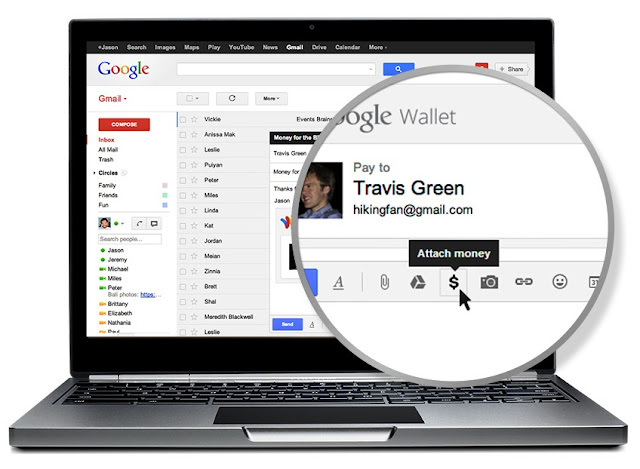 Just look for the Google Wallet button to make safer and more secure payments. Finally, we’d like to thank our merchant partners that have used Google Checkout and we look forward to helping many more businesses grow with Google Wallet. Today, we’re letting web merchants know that in six months, Google Checkout will be retired as we transition to Google Wallet — a platform that enables merchants to meet the demands of a multi-screen world where consumers shop in-stores, at their desks and on their mobile devices. Just last week, we announced two enhancements to the Google Wallet platform that are simple to integrate. The Instant Buy API enables merchants to offer a fast buying experience to Google Wallet shoppers buying physical goods and services on their Android apps and websites, while processing their own payments. In addition, the new Wallet Objects API enables merchants to engage their customers with loyalty, offers, and more. but use less than half of these cards regularly because of the inconvenience. And the same goes for tickets, membership cards and other items. Save anything to Google Wallet: Integrate your loyalty programs, offers and more into Google Wallet. Users can save these items directly to their Google Wallet for easy use. Drive customer engagement with loyalty and offers: Showcase your brand, acquire users and engage them through instant loyalty sign-up, real-time updates and offers. Benefit from the broader Google ecosystem: With Google's location services, your users get timely notifications about their saved Wallet objects. Additionally, with a simple upgrade path to Google Offers, you can distribute your offers across Google properties — including Adwords, the Google Display Network and Google Maps for Mobile — and benefit from Google's targeting capabilities. Integration is easy, and you can work with one of our partners to make it even easier. Partners that provide tools to speed integration include Accelitec, Blackhawk, Loyalty Lab, Paytronix, ProfitPoint, Urban Airship and Vibes. We would also like to thank our partners that have already started integrating with the Wallet Objects API. These include Alaska Airlines, Belly, BillGuard, The Body Shop, BJs Restaurants, Raley's, Red Mango, Marriott Rewards and RetailMeNot. Attendees at Google I/O can see demo loyalty integrations from Alaska Airlines and The Body Shop, and offers integration from RetailMeNot. We plan to launch these loyalty programs, offers and more to consumers as soon as we can. In the meantime, if you're a merchant or developer, you can learn more, sign up and start building innovative capabilities for your consumers. Consumers want access to all of their loyalty cards, offers, and more on their smartphone. An average household has 18 loyalty cards but use less than half of these cards regularly because of the inconvenience. And the same goes for tickets, membership cards and other items. Paying back your friends is now as simple as sending an email, whether you're chipping in for lunch or reimbursing your roommate for your share of the rent. Google Wallet is now integrated with Gmail, so you can quickly and securely send money to friends and family directly within Gmail — even if they don't have a Gmail address. It's free to send money if your bank account is linked to Google Wallet or using your Google Wallet balance, and low fees apply to send money using your linked credit or debit card. We're rolling out this feature over the coming months to all U.S. Gmail users over 18 years old, so keep an eye out for the $ icon in the attachment options. You can also get earlier access if your friends have the feature and send money to you. abandoning their shopping carts. Last October, we launched a Google Wallet API to speed up payments on mobile sites. Today, we are inviting U.S. developers to sign up for our new Google Wallet Instant Buy Android API, which makes buying in native Android apps fast and easy. The Instant Buy API is designed for merchants and developers selling physical goods and services, who already have a payment processor and are looking to simplify the checkout experience for their customers. Developers selling digital goods within their apps will continue to use Google Play In-app Billing, which offers full payment processing capability, including support for carrier billing and gift cards. Fast checkout for Android users buying physical goods. Users who buy on Google properties have set up Google Wallet. They can now checkout in Android apps in as few as 2 clicks without having to manually enter their billing or shipping information. Google Wallet securely sends this information to the developer with the user's permission. Easy app registration. More logged in users. By implementing Google+ Sign-in along with Instant Buy, developers can enable users to sign-in directly with their Google account, instantly creating an app registration. Having more logged in users allows developers to deliver a highly engaging, personalized experience. More secure payments. All transactions are monitored for fraud 24/7 and covered by Google Wallet Purchase Protection to enable a safer shopping experience for your customers. Easy integration. No Google fees. Since Google is not processing payments or managing fulfillment, there are no additional fees or complex integrations. Apps integrated with Google Wallet will require the latest version of Google Play Services, which is rolling out to all Android devices in the next day or so. Airbnb lets you list, discover, and book unique accommodations worldwide. Booking.com is your key to the best deals on hotels, apartments, and more in over 41,000 destinations. Expedia helps 30 million travelers a month find what they are looking for. One traveler at a time. Fancy allows you to discover and buy goods from a crowd-curated catalog. GoPago live POS allows merchants to broadcast their business to customer smartphones, enabling customers to browse, order, and pay in advance. NFC Task Launcher lets you build macros on your phone that respond to your NFC, WiFi, and Bluetooth triggers. Priceline helps you book the best prices on hotels when you're on the go. Rue La La is the destination for the most desired brands and curated Boutiques at Members-only prices. Tabbedout lets you pay your restaurant or bar tab securely with your phone. Uber gets you a ride with a tap of a button. Request a pickup at your location, track your driver's progress, and pay seamlessly in-app. Wrapp lets you give free and paid gift cards from your top brands. To learn more, please visit our Google Wallet for Business site. For the latest updates on Google Wallet please subscribe to our +Page. Shopping for physical goods on mobile devices is a difficult experience for consumers, leading to 97% of mobile shoppers abandoning their shopping carts. Last October, we launched a Google Wallet API to speed up payments on mobile sites. Today, we are inviting U.S. developers to sign up for our new Google Wallet Instant Buy Android API, which makes buying in native Android apps fast and easy. and globally. We believe these changes, and the improved user experience, will create new opportunities for merchants and help retailers of all sizes attract more customers to their stores. We are improving our support for merchant-defined multipack. For example, many consumer products like toothpaste are sold in custom multipacks. The feed specification now clarifies how such products should be submitted. We are moving towards a world with high-resolution displays. Therefore, we are also starting to recommend higher-quality images with at least 800 pixels in height and width to give users a better visual representation of advertised products. Some products like custom goods, vintage items, or collectibles don't have unique product identifiers. For such products, we are now introducing the 'identifier exists' attribute. Additionally, we have updated our requirements on unique product identifiers. We have updated our guidance for the description and color attributes to make them more precise and actionable. We now provide dedicated support for energy efficiency labels and unit pricing for merchants targeting countries in the European Union and Switzerland. Merchants promoting non-family safe items on family-safe websites can now tag individual items as non-family safe. Some of these changes won't be visible to Google Shopping users immediately. We want to give merchants enough time for preparation and adoption. We encourage merchants to use the test feeds feature or the feed debugger to ensure that their updated feeds can be processed correctly. Merchants can review the new feed specifications and a summary of attribute requirements to help prepare for these changes. They should always make sure to comply with legal requirements while participating in the Google Shopping program. For accounts that are currently exempted from requiring unique product identifiers, Google Shopping will start enforcing these new requirements for unique product identifiers on July 15th, 2013 in the US, and September 16th, 2013 in all other target countries. Enforcement for all other accounts will start July 15th, 2013 for the US, France, Germany and the United Kingdom, and September 16th, 2013 for all other target countries. Non-compliant items might then be disapproved and disappear from Google Shopping. Account level exemptions for unique product identifiers won’t be supported after the above mentioned dates – the 'identifier exists' attribute should be used instead. Last year, we announced the rollout of the new Google Shopping commercial model built on Product Listing Ads both in the United States and globally. We believe these changes, and the improved user experience, will create new opportunities for merchants and help retailers of all sizes attract more customers to their stores.